Yelling louder won’t help anymore. Only yelling better things will. Content is everywhere. There is campaign content, customer-service content, employee-generated content, event content, product content, marketing content, sales content, etc. Even advertising is content. Our content goals and mission are critical to success. Our strategy should outline our key business and customer needs and how our content efforts will address them. First we need to have a content strategy which essentially focuses on the type of content we want and on content creation. Content Strategy is a sub-discipline of user experience (UX). A person managing company’s content strategy considers the company’s content holistically and shapes the way that body of content influences people’s experiences with the brand. We as content strategists think about how all the company’s content fits together. Content strategy is like an umbrella strategy. Academic Content Writing: Academic content writing is research and in depth analysis of a subject. Academic content writing includes content in the form of essays, presentations and analyses. Advertising Copywriter: We can use advertising copywriters to keep the copy short and powerful like online advertising, landing pages even home pages as also in traditional media like print, TV, radio, billboards, etc. They’re at home making every word work harder and keeping copy concise. An advertising copywriter is perfect suited for establishing and meticulously maintaining brand voice. Autobiography Writer: A memoir typically records one area of life such as his career while an autobiography is records an entire life. An autobiography is simply an individual’s real incidents brought together in a book. It is an account of a person’s complete life. Brand Journalist: Brand journalist’s are great at finding stories and constructing narratives that fit a brand’s vision and mission. Brand journalists are masters at writing headlines as online journalism lives and dies by click-throughs based on those headlines. Brand journalists are a solid match for content marketing pieces because they’re naturally geared for storytelling. They are also good for stories pitched for third-party placement, content highlighting company’s history or reason for being, newsletters, community involvement stories even blog posts that take on a more narrative or investigative angle. Business Writer: Has expertise in writing business documents like sales proposals, memos, concept papers, summaries, Request for Proposals (RFPs), tenders and more. Conversion Rate Optimization/Lead Generation Writer: This kind of writer has a laser focus on driving action. They have strong knowledge of data, analytics and psychology and understand selling methodologies as well as know how to synthesize objections and barriers to sales that helps potential customers move closer to a sale. Conversion rate optimization or lead generation writers are perfect for tasks like: Calls to action, Landing Pages, Online pay-per-click (PPC) ads, Sales letters, and Web banner ads. Corporate Social Responsibility (CSR): These content writers write for the CSR of the company. Curated Writer: Curating content is a required piece of content marketing strategy. Content curation involves gathering relevant information relevant to a particular topic or area of interest and organizing it in a descriptive yet curated form for the benefit of the business as well as end users. Services or people that implement content curation are called curators. Digital/UX Writer: Digital/UX writers understand complex kinds of digital journeys and have strategies and tactics to help guide people through the journeys they want to take along with guiding people through journeys the client wants them to take. Digital/UX writers are analytical and use data to take important writing decisions and are adept at writing core pages for websites. Ebooks: The writers developing ebooks are in huge demand as the penetration of internet is growing. Feature Writer: Involves creative writing used in short stories, poems, blogs on lifestyle and fashion, etc. Fiction Writer: When it comes to writing fiction, no rules are carved in stone. A writer is free to bend, twist, smash or shred any of the golden platitudes of writing. Fiction writing is usually developed to entertain the audience with a fictitious storyline. It is an author’s art to develop a non-factual composition that may look real to its audience. Generalist: Generalist copywriters are jacks-of-all trades. They are great choices for high-volume and for content that doesn’t require a lot of expertise. Ghost Writer: A content writer writes an article and turns over all rights of it to the concerned clients. The result is that the client can post this article under his name or modify it in any way he wants. Grant Writer: Grant writers tell stories and convince audience by mixing the rational and the emotional in a structured way. Grant writers are organized and detail-oriented because their deliverable has to meet specific requirements of the grant-awarding organization. Even a small misstep can hurt the chances of winning a grant. They also have to be prompt as grant applications have submission deadlines. Grant writers are experts at capturing the essence of a company’s mission, vision, personality, story and weaving them into a proposal. Industry Focused Writing: Digital marketing has influenced every industry. The demand for writers having the understanding of digital media along with the expertise in different industries is evident. The writers often come across content writing services like medical writing, travel writing, food blogs, curriculum writing, etc. Influencer: Influencers give brands the advantage of their built-in content amplification abilities. The influencer helps put the content in front of more and different people than the brand might have reached otherwise. Influencers add credibility to content with the influencer’s credibility creating a halo effect around the brand. Instructional Design: It is the job of instructional designers to write and improve the quality of instructional materials. News/Journalistic Content Writing: Journalistic content writing is news writing. News articles are written to inform rather than to convince which is why they follow the inverted pyramid structure are neutral in nature and follow the reporting formats. Legal Writer: A legal writer has a clear understanding of the law of the land and is an expert at legal drafts, phrasing laws, etc. Marketing/Communication Writer: This writer is involved in campaign-building and writes content for marketing collateral such as flyers, etc and running communication through various platforms. Press Release Writer: The purpose of creating a press release is to make a newsworthy announcement. The two primary objectives of press releases are to inform the world about the recent developments and to create a positive impression of the organization in question. Product Description: To sell a product/service, a content writer needs to share all the relevant details, specification, and features of the product with the potential customer. Product information and features need to remain intact in the content. Regional Writer: Regional content refers to the content written or communicated to the audience in regional languages. In this style of writing which includes both poetry and prose, the setting is particularly important and writers emphasize specific features such as dialect, customs, history, and landscape of a particular region. Research & Report Writer: Research & Report writer taps on facts, data and findings. Review Writer: Review writing can be biased and unbiased depending upon the assignment. The writing is typified by an analysis of a product or a service that potential buyers can read to make up their minds about the purchase. Script Writer: A screenplay writer also called a screenwriter, scriptwriter or scenarist is a writer who practices the craft of screenwriting. They write screenplays on which mass media, such as films, television programs and video games are based. SEO Copywriter: SEO copywriters know how to integrate target keywords and phrases into a web copy to maximize organic search benefits and avoid penalties. They undertake keyword research and are exactly the writers needed to help our website rank better organically in search results in order to get more traffic. Social Media Writer: Social media writers write social content to spur conversation and interaction. They’re well-versed in creating content tailored to the requirements of different social networks. Social media writers know how and when to use hashtags, links, questions, polls, provocative statements, etc. They manage multi-touch content journeys as the conversations that start on social often lead to content on other media like company websites, community forums, contests, etc. Social media writers know the ins and outs of how often we need to post, best posting time for different social networks to maximize interactions, etc. Social media writers re-purpose content into snackable social content. Subject Matter Expert: SME’s have a deep understanding of the respective industry and can write with authority about it. They can tackle topics in depth and often take unique, insightful angles on them. Technical Writer: Technical writers are focused on highly technical content. They have the ability to make complex concepts easy to understand and are experts at sequential thinking. Technical writers are thorough, detail-oriented, methodical and efficient and at the same time balance that with the needs of the often non-technical audiences with different levels of comprehension.Technical writers are great for contents like: Guides, How-to’s, FAQs and can even do a good job with Instructions and Manuals. Transcripts & Translation Writer: Transcription is the process of listening to the audio file and writing what has been said down verbatim in the same language that the original speakers used. A translation is the process of taking that written text and translating it into another language. Travel Writer: Travel writing focuses on locations and trips. This type of writing is wordy, elaborate and descriptive. The purpose is to help people plan their trips through relevant businesses. Web Content Writer: This type of content writer creates content that becomes a crucial part of the web pages for example the ‘About Us’ page that most websites possess. The content writing services mentioned above are some major forms of content writing but there can be much more to add to the list. Each variant or version will need to be approached differently. What this means is that generic tips do not work for content writing and specific know-how and skill set is required. Content apart from being in the form of text such as a technical article, interview, review, survey, etc can also be in the form of images & infographics and can also be in the form of an audio, video and screencast. 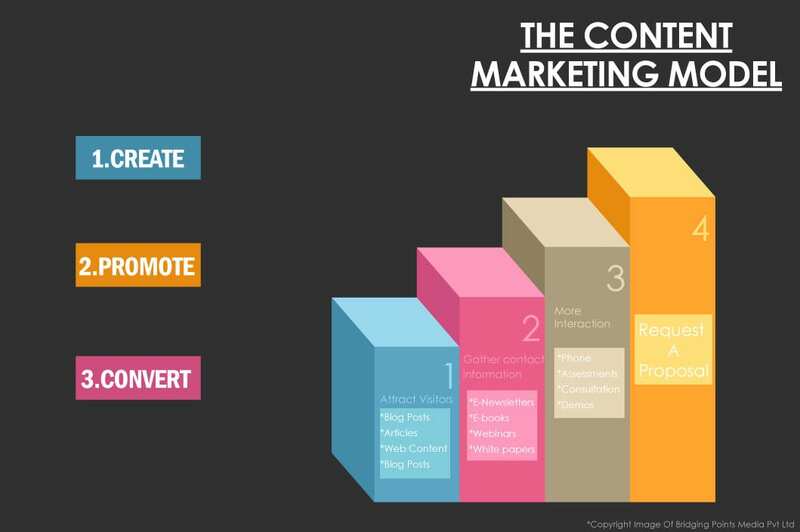 Second we need to have a content marketing strategy which essentially focuses on the distribution of this content for maximum reach and visibility to the right target audience. Now let’s understand distribution of this content that we have created i.e. essentially Content Marketing. Content marketing is about attracting an audience to an experience that we own, build and optimize to achieve our marketing objectives. 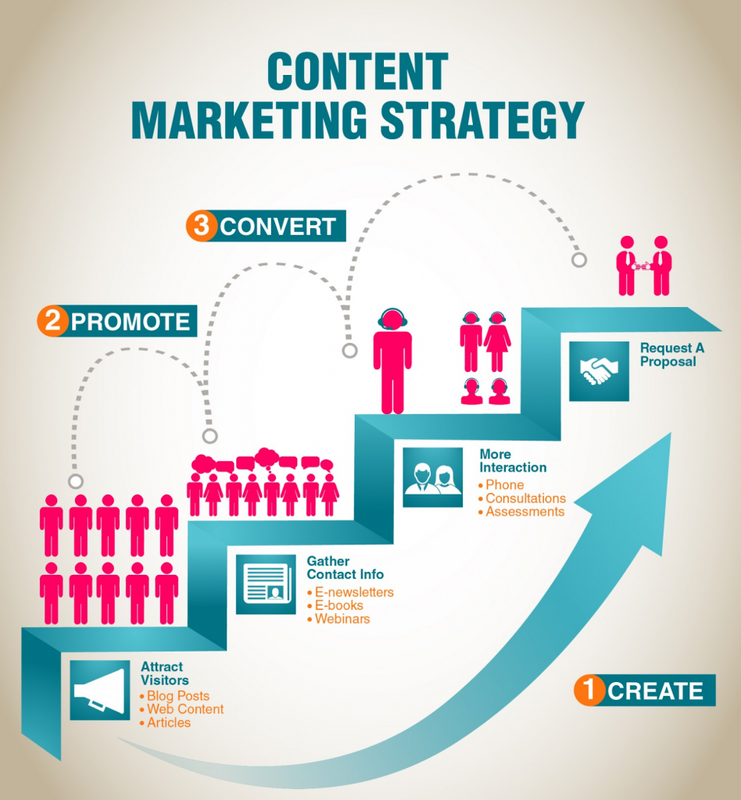 Content marketing is a marketing strategy focused on creating, publishing and distributing valuable, relevant and timely content with an objective to attract and retain visitors or customers – ultimately leading to profitable customer action. An understanding of the typical buyer’s journey. Each content asset should appeal to one or two personas at each stage of the buying journey, gently nudging to the next stage. We are living in a time and age where the buyer does a right amount of research – mostly online, before actually buying a product or a service. In this process the consumer wants to be 100% sure of the product/service and proactively reaches out to the brands and businesses to seek answers and help. The average buyer guides himself through 60% to 90% of the traditional sales funnel before ever contacting a brand or salesperson. Content marketing is the answer to this buyer-driven environment. Increased brand awareness: As prospects and buyers search the web for answers to their questions and solutions for their problems, the brand continues to show up. Increased brand preference: Content marketing helps to further establish the brand as a thought leader in the industry, which strengthens relationships with buyers. 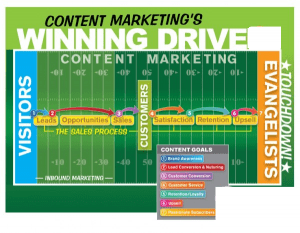 Content marketing refers to the act of sharing knowledge, advice, or entertainment in a consumable format. Content marketing through relevant and practical content taps various digital and non-digital mediums to reach out to the potential buyers. 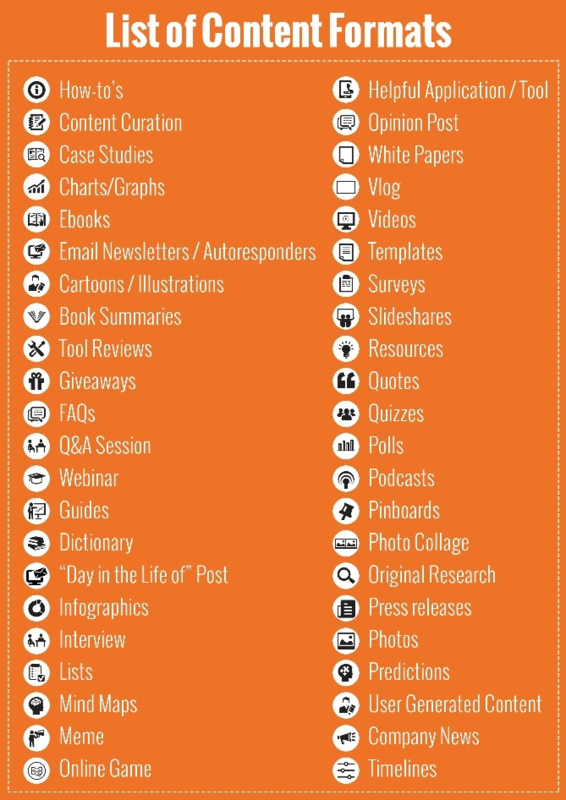 These mediums can be social media, article posting, e-newsletters, case studies, blogs, white papers, webinars/webcasts, print magazines, videos, promotion of content in traditional media, microsites, print newsletters, research reports, podcasts, digital magazines, virtual conferences, ebooks, infographics, books, etc. The type of content we share is closely related to what we sell; in other words, we’re educating people so that they know, like, and trust us enough to do business with us. That people don’t want advertising when making purchasing decisions, they want valuable information — content. 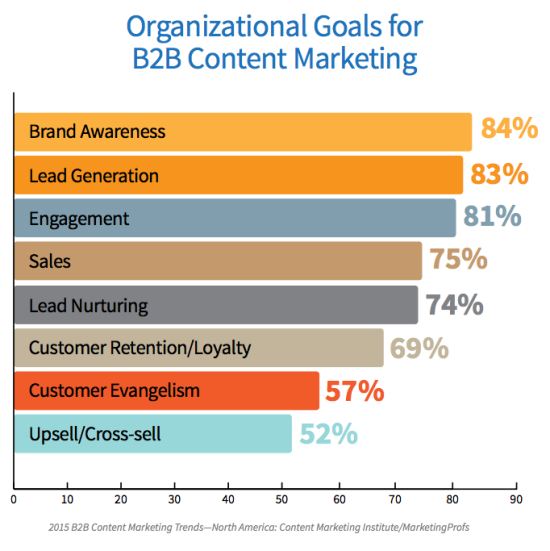 Content marketing is thus equally relevant in the B2C & B2B space. Our attention will always go to those who tell great stories. 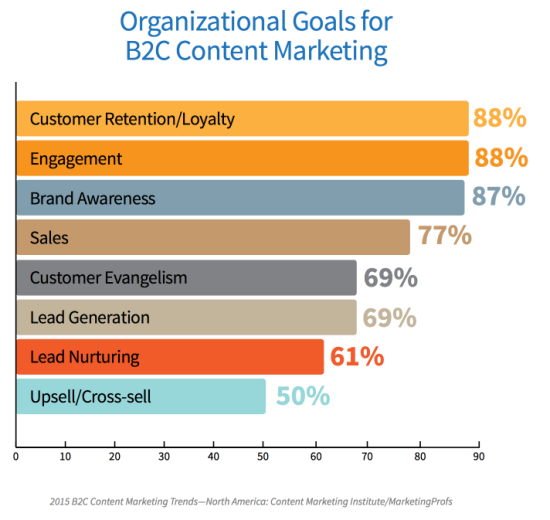 The ultimate goal of content marketing is to grow our business. 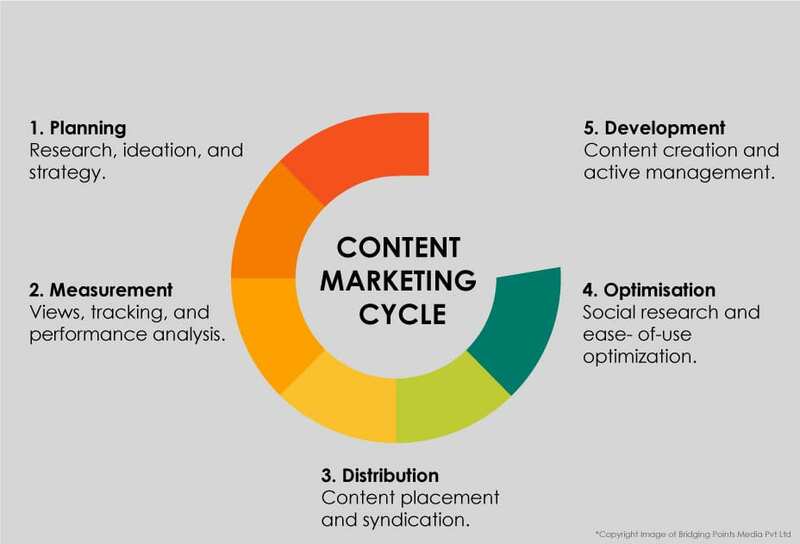 Content marketing is then the creation of high quality and valuable content to attract, inform and engage potential customers and in the process promote the brand. It is a natural human tendency to believe an editorial or a news piece/content more than an ad content. Hence we witness a massive demand for advertorials. Marketing taps this mindset with content marketing. Content Marketing is all about building an audience base that strengthens the company’s business through high quality and long lasting refined content per the brand and business needs. First we map the content to the pain point. Then we use the right type of content for that problem. Finally, we map the content to the buying cycle of the people who have that problem. Our strategy is to move the focus away from the marketer and to the person that the marketer is trying to reach. 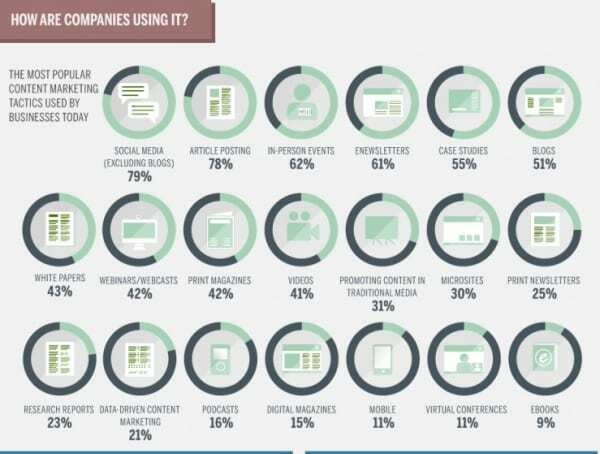 74% of buyers expect to access simple items like infographics for free but 77% are willing to provide basic information for a white paper. Gating bigger resources is a great way to generate leads, learn which of your visitors is serious and then nurture leads. Content marketing helps us build a content library for the brand along with driving specific business objectives. Content marketing as we understand is about giving away information to build relationships and earning trust but gating some of the best content is an acceptable and valuable practice. We analyze what content is needed to fulfill different business goals across the customer journey or for branding purposes. We make an inventory of existing content and other resources or pieces of information that can be turned into content. We set up the proper content plan collaboration and schedule processes. We develop a narrative that takes into account the brand’s promise and unique value proposition. We link the brand with the business goal and customer intent through content. We establish the tone of voice, style, etc. We plan a content strategy for different channels – each channel has specific characteristics, technical aspects, usage patterns, etc. Twitter is not Google is not email is not LinkedIn is not a webinar. W make sure the content gets found by and shared with the different buyer personas and target audiences. We define content-specific metrics and KPIs needed to meet the overall marketing/business goals as defined in the content marketing strategy. We create, source, aggregate, curate, optimize content and use the tactics that work best. We define a proper mix that fits the goals and the customer journey, regarding formats, channels, etc. We provide the content in different formats each with their specific calls-to-action, depending on individual stages. We understand that several touch points are good from a brand perspective. Repetition, variety, choice and multiple formats are all okay if they are relevant. We map content to pain points, questions and buying cycle. We elaborate on the buyer personas from a content strategy perspective. We plan campaigns in the overall marketing strategy whereby the various content marketing tactics can be combined. We define governance, content flows, manage content assets, store ideas and data, etc. We look at less typical content needs, e.g. for customer service. We analyze competitors, markets, what customers/prospects want and say, the marketing place, do a baseline analysis, etc. We need to test, optimize, test, optimize, test, optimize. To Get More People To The Content – That is we take the content from the content provider through the distributor to the end user. No matter how good the content is, what matters is how it’s distributed. The fastest way to drive traffic to content is through paid social media. We must pay to promote B2B content to individuals and not just to businesses. We drive more traffic to content by double downing on a singular topic. We re-purpose highest performing content into high-quality videos. We trigger content based on dynamic modules on the site or through email campaigns, etc. If Content is King, (content) Marketing is Queen! ..